The recent revelations from opposition leader and Foundation for the Fight Against Corruption (FBK) founder Aleksei Navalnyi has had a limited ripple effect in society but may reflect somewhat more turbulence for the regime’s ruling groups and their leader, Russian President Vladimir Putin. On March 2 the FBK published an article and video detailing a large empire of foundations. One is a supposed philanthropic foundation ‘Dar’ or ‘Giving’. It appears to stand at the center of the empire’s acquisitions around which others such as ‘SotsGosProekt’ and ‘Gradislav.’ Through Dar’s and the others’ accounts investments are made by Kremlin-tied oligarchs, and various properties, including wineries, yachts, and luxurious residences are held and de facto ‘owned’ indirectly by Russian Prime Minister and former Russian president Dmitrii Medvedev. Navalnyi’s estimation is that the sum of the properties can be valued at R70 billion – approximately $1.2 billion (http://dimon.navalny.com). At a maximum this activity could amount to misuse and expropriation of state funds, embezzlement, and money laundering. At a minimum, the construction, accumulation and use of high-cost real estate under the auspices of a charitable organization is almost certainly a violation of Russia’s Law on Philanthropic Activity, as they are not included in Article 2 of said law which lists the goals that constitute philanthropic activity and would allow a structure to be treated under Russian law as a charitable foundation. If the allegations are accurate – and they appear to be well-documented – then at the most obvious level they reinforce our view that the scale of corruption in Russia (and other post-Soviet states like Ukraine) is and for years has been massive. There is nothing new here. However, the revelations suggest several other important developments. First, Navalnyi’s investigation reveals that he has ‘cahones’, as the Mexicans might say. He has leveled a potentially major blow against the ruling cluster of clans protected by Putin and against Putin himself, not just to Medvedev’s clan. Navalnyi makes that clear in the video in which he states explicitly that Medvedev’s empire likely pales in significance to Putin’s and that as president Putin is responsible for Medvedev’s alleged illegal activity as well. Second, Medvedev has attained considerable autonomous power. This is evidenced by his possession of his own property empire for his own clan of family and friends separate from that enjoyed by Putin’s clan under the ‘Ozero’ scheme. Like Ozero, Medvedev’s ‘Dar’ (Gift) is built on family members, friends, such as former classmates, their offshore accounts, front companies and foundations, kickbacks, investments, construction, and commercial enterprises. But there appears to be no overlap between Ozero and Dar, suggesting that Medvedev has built himself an autonomous business scheme and has been allowed or has taken the initiative in stealing from the state ‘po chinu‘ – that is, according to one’s rank as is expected within Russian state apparatus and connected elite. Medvedev’s empire now corresponds to his formal status as the second most powerful figure in Russian politics. Third, the mass of detail in Navanyi’s report also suggests that he has acquired his own considerable resources under his FBK corruption-fighting enterprise or he has received assistance from a powerful outside entity. Where his resources come from is open to debate. His site appeals to viewers to make contributions to the foundation. However, it is unclear whether such contributions are sufficient for the mass of work the organization produces or whether he has large donors at home and or abroad. The scale of the investigation and the amount of material uncovered MIGHT be of such an extent as to suggest that some in Western, pro-Western, or Russian state organs might have assisted in uncovering some of the information or provided leads for Navalnyi’s researchers to follow up.donations also suggests. If information was lent by the CIA or other Western secret services, then this attack is just another part of the new cold war’s information/disinformation strategic communications battle. It is also an attack that likely originated before or at about the same time the alleged Russian hacking of the U.S. political entities began. IF hardliners in the Russian state, such as the FSB, leaked material to Navalnyi, it could be an effort to undermine Medvedev so he is not appointed prime minister during Putin’s fourth term. But given that the revelations also represented an attack harming Putin on the eve of the presidential election, all this begs the question: Why would some in the secret services or elsewhere inside the Russian regime want to threaten Putin? Could it be that Putin is wavering about running for a fourth term or some fear he might so waver or abandon his post? 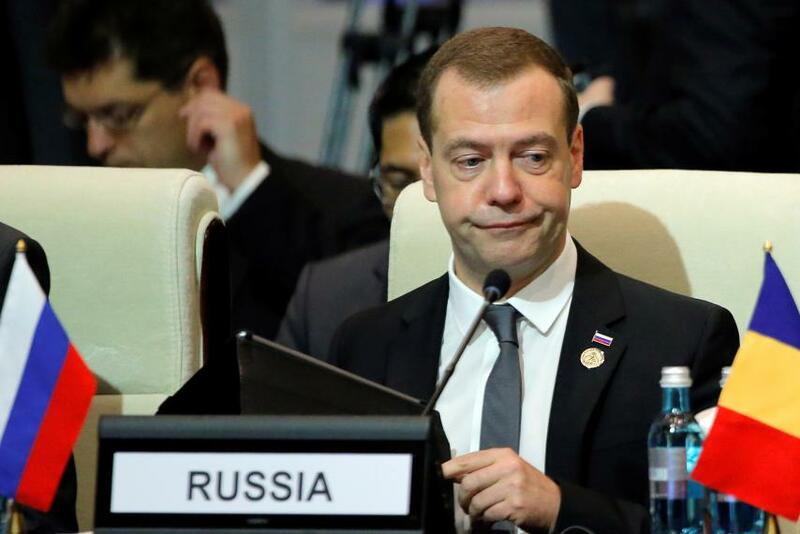 If so, then the attack could be designed both to undermine another Putin-Medvedev castling move, with Medvedev returning to the presidency or it could be a way of forcing Putin to stay. Powerful clans inside and attached to the Kremlin enjoy Putin as the guarantor of stability and the cover for their financial, business, and political-economic machinations. His departure from the presidency would threaten their livelihoods and their futures outside prison walls. Fourth, although some opposition-oriented analysts are constantly claiming that social protests are increasing, society outside elite political society displayed little interest in the revelations. Indeed, the population, most media, and even nearly the entire democratic opposition barely reacted to the allegations, seeing them as par for the course. No significant or meaningful protest emerged, suggesting that those protests that are active are local and single-issue protests, not political and certainly not characteristic of a revolutionary or even pre-revolutionary situation. The main reaction among the democratic opposition came from Yabloko Party leader and presidential candidate Grigorii Yavlinskii who, echoing my conjecture on assistance from state actors, claimed Navalnyi’s actions were part of Putin’s presidential strategic communications – a trial balloon to see if he can dump Medvedev as prime minister after the presidential election (www.ng.ru/politics/2017-03-06/1_6942>navalny). This seems unlikely since the revelations potentially undermine Putin, given it occurred on his watch and he is so close to Medvedev. Yavlinskii was countered by Solidarity bureau member Ilya Yashin who criticized Yavlinskii for taking state budget financing and wondered why Navalnyii would cooperate with state players who have opened five criminal cases against him and sent his brother to prison (www.ng.ru/politics/2017-03-06/1_6942>navalny). The regime has remained largely silent. No response personally from either Putin, Medvedev, or any official, though spokesmen and spokeswomen have commented by questioning who the information came from. This is now the tactic of all ruling elites regarding uncomfortable information or allegations about their members not just the Russian elite. Recall the reaction of Hillary Clinton and the Democratic Party to the Wikileak revelations regarding the Clinton presidential campaign’s direct collusion with supposedly objective media outlets. The focus was shifted entirely to who provided the information, and the Kremlin was charged with being the culprit. Nevertheless, the silence may speak of a considerable degree of discomfort about such allegations emerging as the Russian presidential campaign is set to get underway in autumn and about what else Navalnyi and/or others may have up their sleeves. About the Author – Gordon M. Hahn, Ph.D., is an Analyst and Advisory Board Member at Geostrategic Forecasting Corporation (Chicago), http://www.geostrategicforecasting.com; member of the Executive Advisory Board at the American Institute of Geostrategy (AIGEO) (Los Angeles), http://www.aigeo.org; Contributing Expert for Russia Direct, russia-direct.org; Senior Researcher at the Center for Terrorism and Intelligence Studies (CETIS), Akribis Group, San Jose, California; and an Analyst and Consultant for Russia – Other Points of View (San Mateo, California), www.russiaotherpointsofview.com.